AJ Fernandez is constantly coming up with a ton of new blends and each one seems to be better than the one before it. When is the madness going to end? 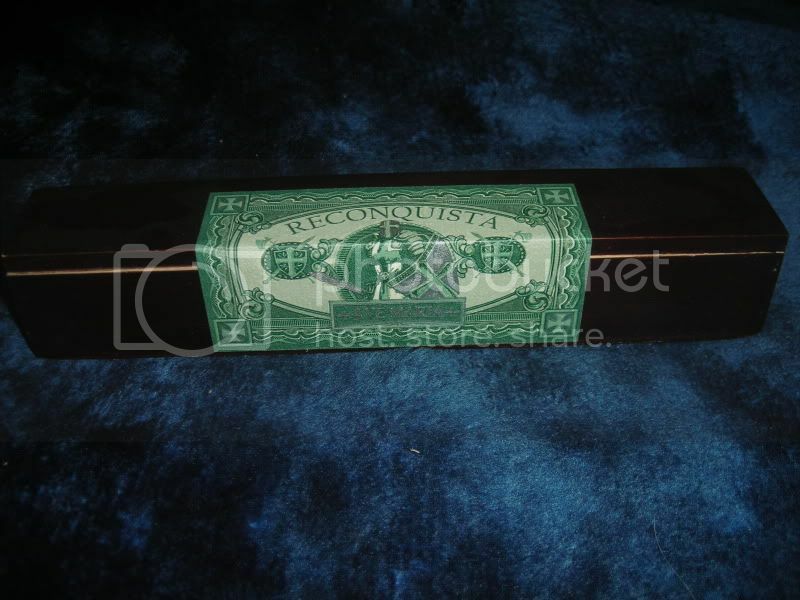 One of the more recent creations is the Ave Maria Reconquista. First off, theres the packaging and presentation. I purchased a box of three and each cigar comes in its own individual coffin. 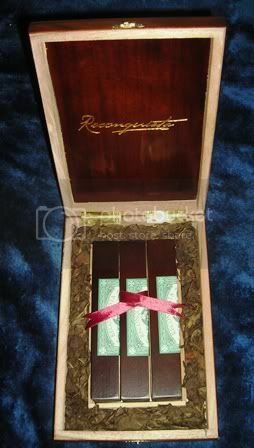 The coffins are placed into a bed of scrap tobacco in a beautiful box. The presentation is elegant and first-class. The cigar itself is a huge 7 x 54 torpedo and is wrapped in a flawless Brazilian Habano Oscuro leaf. Supposedly, this wrapper is really rare and apparently its the first time its being used. The binder is Honduran and the fillers are Nicaraguan from the "big three (Jalapa, Condega, and Esteli). The wrapper is dark with minimal veins and glistens with oils. Smelling the wrapper and the foot of the cigar only hints at its complexity with damp earth, leather, and sweet spices. After a careful torching, the cigar lets you know that youre in for a treat. The flavors are rich and complex right from the start with oak, well-oiled leather, coffee notes, and black pepper up front. The smoke is thick and creamy, almost to the point of being chewy. The draw is flawless and the burn is as straight as can be. The first third is definitely full bodied. The strength seems to taper off a bit during the second third, but the flavors and complexity still boggles my mind. The initial flavors are still there and caramel-like notes add to the taste. During the final third, the flavors seem to intensify and its hard to focus on anything else. At this point, black cherry and vanilla make their appearance. Normally, Ill sit out on my recliner and read a book while smoking. I found myself putting the book down this evening and focusing solely on the cigar. The strength kicks back up to the lower end of full and by the time the cigar is nubbed I felt like I was physically and emotionally drained. How good is this cigar? After some serious reflection, I honestly have to say that this is one of the more refined cigars Ive smoked. Easily a Top 10 smoke, and if you look through my Photobucket, you'll know that for me to call it a Top Ten-er is saying something. The Ave Maria Reconquista is the complete package and AJ Fernandez has reset the standards for what a super- premium cigar should be. I believe they maxed the production of these out at 16,000 boxes. For those that thought this is just an Ave Maria with a different wrapper  wrong. Same basic starting package, but different looks and definitely different under the hood. Think of the Ave Maria as the V-6 and the Reconquista as the Shelby. So what exactly is a Reconquista? I had no idea, so after Googling it, I found out that it was a period from about 722 AD to the late 1400s when several Christian kingdoms retook the Iberian Peninsula, the Pyrenees, and part of today's southern France from the Muslims. The box of three retails for $45 but since price versus value is subjective, I truly believe that for the experience that I just went through, the Reconquista is a bargain at $15 each. Obviously not an everyday smoke, but for a special occasion, you'd be hard-pressed to find something better. Hey Steve... Nicely done. I don't have any of these in my humidor so I will have to enjoy it through your review. Thanks. It's a shame that the 3-packs aren't available right now, and it's hard to pony up almost $200 for a box of 12...but this is one smoke that's worth it. Awesome review, I definitely want to try this now. If this stick is better than the Ave Maria, then it will be one good stick because the original was great. $20 price tag puts it on my wish list of cigars that I may never get the opportunity to try. ////// Nothing else has come close. It's expensive, but 3 for $45 is still less expensive than any of the Opus Xs, and it's definitely cheaper than Cubans (which run the equivalent of $25-$30 each over here). Bumped for those on the fence about today's March Madness deal. nobody is on the fence. the deal sold out by the time i woke up at 6am. Great review. I'm curious though...does anyone know about when these hit their "prime"? As in, what's the optimal time to let them rest before smoking? I have 4 currently with more coming from the MM deal today. I'm looking forward to having one of these.. I smoked the first one with a week's rest and the one I reviewed had a month. I smoked one the other day that had 5 months on it and didn't notice any perceptible change. So to answer your question, I would say: fire it up. Sounds like a plan to me! Thanks for the input brother! Mine has a month or so on it, so it should be purty good! At that price, I can get the Padron '26 maduro #2. With all due respect, I don't believe the Reconquista is in the same class as the Padron '26 maduro. Besides, the Brazilian Habano is the same wrapper used on the San Lotano Habano (one of my top 5 favorite cigars), but at considerably less cost than the Reconquista. I think there's more marketing than value going on here. Just my opinion. Great, thanks for looking. I value your input. At that price yes....at $4.50 there is no comparison... To each his own, and I have plenty of Padron in all of my humi's. 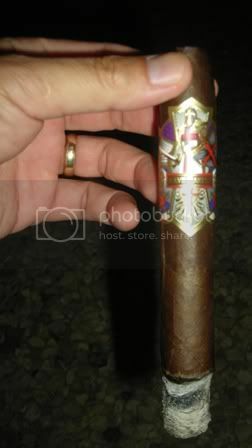 Personally, I do not believe it is a $20 stick...but it is definately one of the best and most complex smokes I've ever had and I keep it in the same category for special occasions. Would I buy a box of 45's first? Yes...but you never see Padron FR or anny for the deal we had this weekend. The complexity of this smoke is unreal IMO, especially as they age. Yea, it really was a shame the eastcoasters missed out on that deal. $4.50 for those cigars was really incredible, but what the hell, there will be another good deal just around the corner. All you gotta do is keep your eyes open and hit it while it's hot. Just read through this and it was an excellent read and review on the stick, really like the extra info like where Reconquista term came from and the production numbers.. way cool! I had this once before myself and had nearly the same experience and very similar flavors as well, your review was right on! I'm finally having my first reconquista, and it is damn good! Spicy, earthy, peppery, a bit sweet aftertaste. Worth every penny! But even better since I got them on the march madness deal and didnt have to pay their premium price. Just smoked one last night that I had in my humidor for about 6 months. It's a good cigar, but not great. The flavor was very one-dimensional all the way through - no complexity like I would expect from a cigar in this price range. For the money I'm sticking with an Ashton VSG.